Luis Pato is, with good reason, synonymous with Baga. I was fortunate to taste his very first 1980 release of Baga in 2013 and it blew me away (check out my review here). Back then Pato, who studied chemistry, not winemaking, was managing the family’s ceramics business. It was not until 1985 that the self-taught winemaker pursued winemaking full-time. 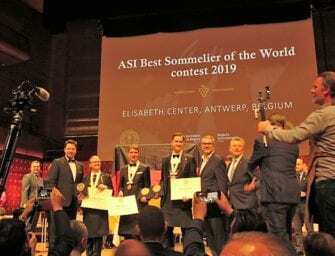 He fast forged his reputation with innovations which elevated the quality and, just as importantly, appeal of Baga, winning this tricky grape new fans at home and abroad. 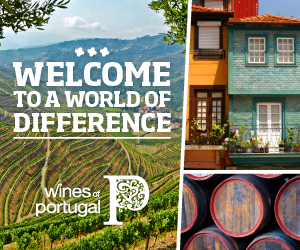 In 1990, against his viticulturist’s advice, he was the first Portuguese producer to practise green harvest. He used this technique at Vinha Pan – a young vineyard – to help Baga, a late cycle variety, ripen earlier. “The idea is when you reduce Baga yields, the tannins turn softer and have much more flavour, so you can drink the wines younger than before.” Expanding on his theory, Pato explained, “usually, Baga is more Nebbiolo-like but, when you reduce yields, it is more Pinot Noir-like,” which quality is typically the preserve of mature Bagas. In other words, you advance the ‘Pinosity’ too. 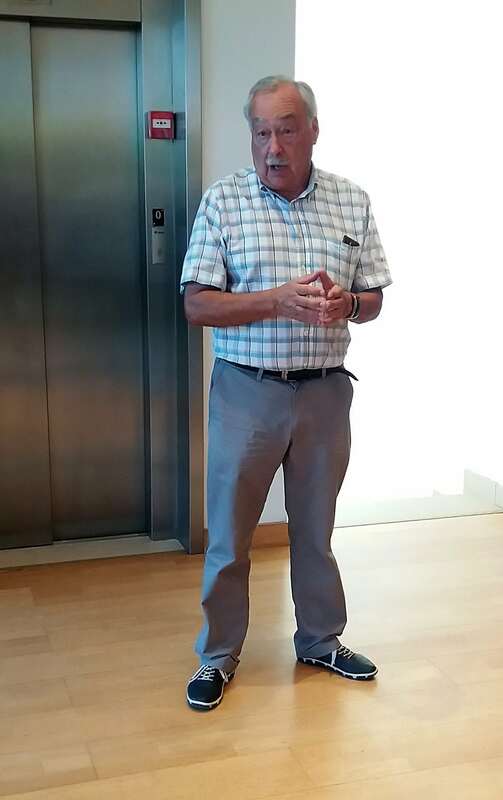 He admits that he didn’t get green harvesting right until 1995, when he started green harvesting after veraison and not after flowering (do the latter and the vine compensates with bigger bunches). The tweaks continue. Since 2011, he has left 3 bunches/vine so as to align Pan’s yield with the natural yield of Barrosa, his oldest (centenarian) vineyard. Apparently, you can’t equalise everything. Pato attributes lower acidity at Pan (compared with Barrosa) to green harvesting. In the winery, Pato introduced de-stemming (since 1984) and ageing in French oak barrels to mellow Baga’s sturdy tannins. Because oak brings its own tannins, from 2009 he switched to bigger format oak and told us he is now buying new, thicker staved (longer lived) French oak 2000l foudres every year. 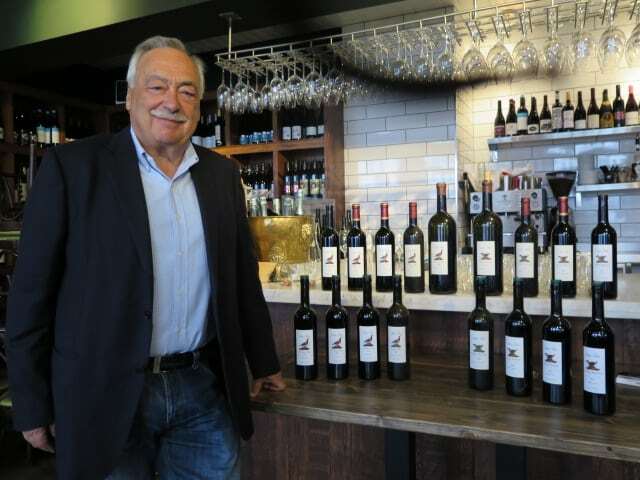 Thanks to this focus on tannin quality, specifically, attaining long chain tannins, Pato reckons it is now best to broach his single vineyard Bagas after six years, not eight, “but best is always 15 years…” He adds, “maybe with longer tannins they will live 25 years not 35 years,” which chain of thought reminds him of another innovation for a Norwegian client who wanted a soft, low alcohol Baga (“because you pay tax by the half degree).” Pato made a “soft” Baga with 11.5% alcohol by co-fermenting Baga with 5% late-picked Bical. Pato has serious form with white wines too, which (see below) can also age impressively. During a vertical tasting of his whites, he explained his approach to oak and white wines. For Bical, he has found new French oak is too much (and chalky clay soil makes for a smokiness anyway). On the other hand, he reckons Cercial needs new oak. He has also found chesnut interesting for some whites. The innovations continue apace. 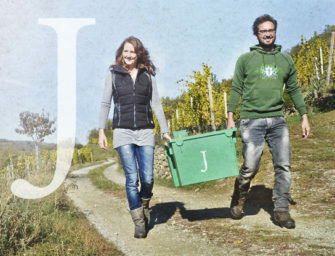 These days, he practises a later ‘precision harvest’ (not green harvest) in order to produce sparkling wines. It makes much more sense than throwing them on the ground and Pato is nothing if not canny. 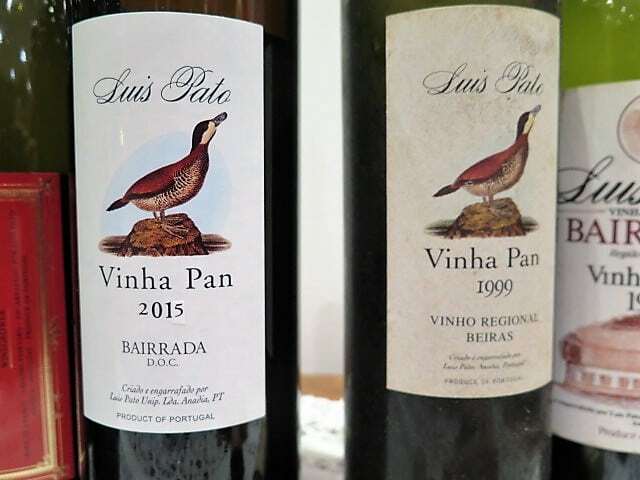 Latterly, he has introduced no-added sulphur wines, Baga co-fermented with white grapes and an orange wine (in honour of his latest grandchild); future plans include a white dessert wine made from Baga from Vinha Pan vineyard. 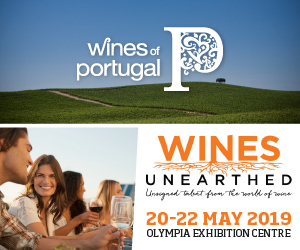 Describing himself as “a classicist and a rebel,” Pato also claims to be the first Portuguese producer to have made a single vineyard wine. Explaining his idea to produce a range of single vineyard wines, he said “my idea of Bairrada is that it is close to Burgundy – one grape, on chalky clay soil, so if I plant it in different places, the wine must be different.” He is proud to be the only Bairrada producer who can showcase this over a lengthy period of time, with 32 vintages from two vineyards. Some years ago, the winemaker told me that years with a five in tend to be top for Baga; 2015 is a case in point. Looking back, he detects a 20 year cycle when he compares wines from past and present – 2015 to 1995 (and this year to 1997, with veraison a month early). 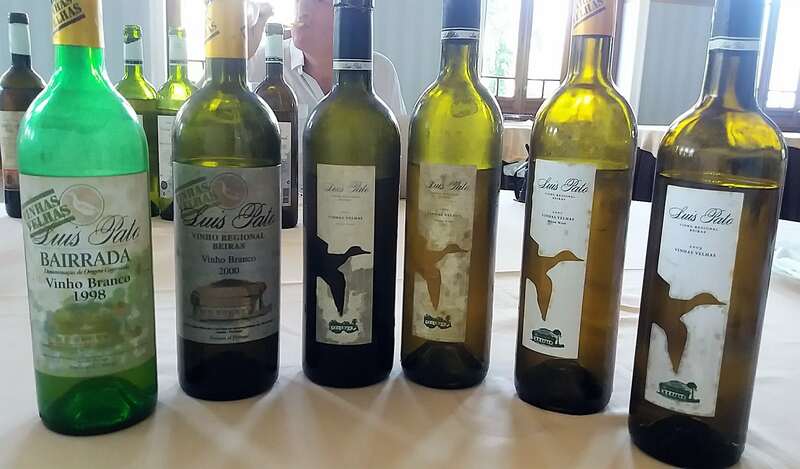 During the visit and at a subsequent vertical tasting in London on 25th September, Pato generously showed a number of older wines. to illustrate his point. Below, you will find my tasting notes, which include the latest very impressive 2015 releases. As for the current year – 2017 – Pato finished picking on 22nd September. He reported that Bical had “huge, fantastic” acidity – 7.1 TA versus 5.5 TA last year on account of 2017’s very fresh nights. He reckons while similarly early, 2017 will be even better than 1997. 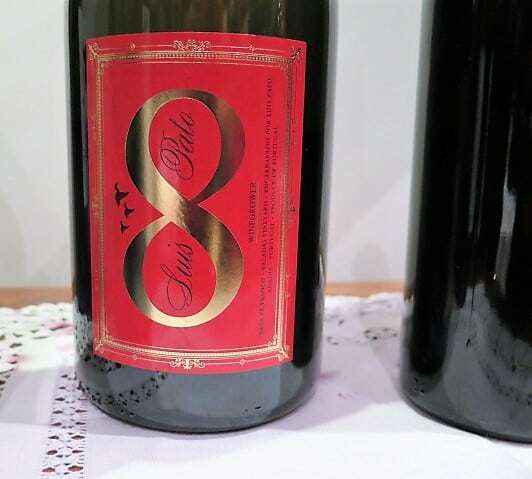 This white fizz is made from Baga grapes (Pato harvests 9 bunches per vine for sparkling production around 3 weeks before harvesting the remaining 3 bunches for reds with riper tannins – “a big approach to the Pinot Noir style, not Nebbiolo.”). It is pale with a distinctly salty, iodine/kelp note to nose and frisky, lemony, bone dry palate and a touch of cheesy, savoury lees to the finish. If you wondered what sparkling Chablis might taste like, try this! Very good – punchy and mineral with terrific salinity. I think this cuvee is some way off release but, in the meantime, I can heartily recommend Pato’s Maria Gomes fizz (with 10% Sercialinho). It features satin-pipped ripe apples, with a nutty mousse and fresh, saline riff of acidity. Pale pink with Baga’s tell tale flinty, smoky, kelpy nuances. Delicate fruit and a lively bead. Sophisticated (polished, if not wildy complex)) with nice length and freshness. Pato has only used free run juice since 2010 to increase the quality of his bubbles (he uses the press juice for his sweet abafado wines made by cryo-extraction – “no waste,” he said). This single varietal/single vineyard white is made from Bical from chalky clay soil. All the wines in this line up were fermented and aged for around 6 months in new French oak. Very young with classical proportions – lovely balance and measure to its cusp of ripeness stone fruits. Needs time. Yellow/straw hue with beurre noisette notes to the nose, a wet wool/slightly dank note – wormwood? – which follow through on a palate with pronounced oyster shell and a creamy, leesy finish with balanced acidity. 13% Good. A slightly deeper, yellow hue with a fruitier palate with perfumed lychee and ripe, sweet mandarin with a lick of fennel and creamy beurre noisette which build on a long but succulent palate. Very good. A golden hue with ripe peach, juicy, exotic mandarin, mandarin pith and pick grapefruit. Fleshy, quite round and primary still with nice clarity. Young. Very good. A deep golden yellow with a spicy nose and palate and good depth of ripe, yellow peach, saffron-poached pear with citrussy acidity and a lick of saline. A touch of warmth to the finish in this hot year. Good; holding well. Transitioning into antique gold with spicy apricot and savoury, slightly bitter kernel notes. I’d drink this up. Bronze with pot porri and a biscuit quality to the finish. Drying out. This is a new Vinha Formal cuvee, made from the Cercial grape. 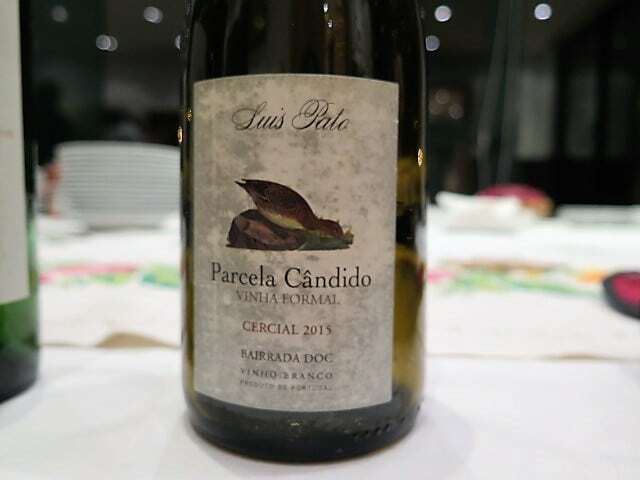 Pato reckons Cercial from chalky clay soils is the next big thing in Bairrada’s whites. Why? Because it holds its acidity better than Bical in warmer years. Having made a terrific tribute wine to his friend David Lopes Ramos in 2011, this single varietal/single vineyard Cercial is set to become a regular feature of the range. I’ve tasted this wine before and this bottle seemed more phenolic/terpenic, with a nutty, incipiently oily texture; broader peachy fruit and creamed almond too. On both occasions, I preferred the 2011. 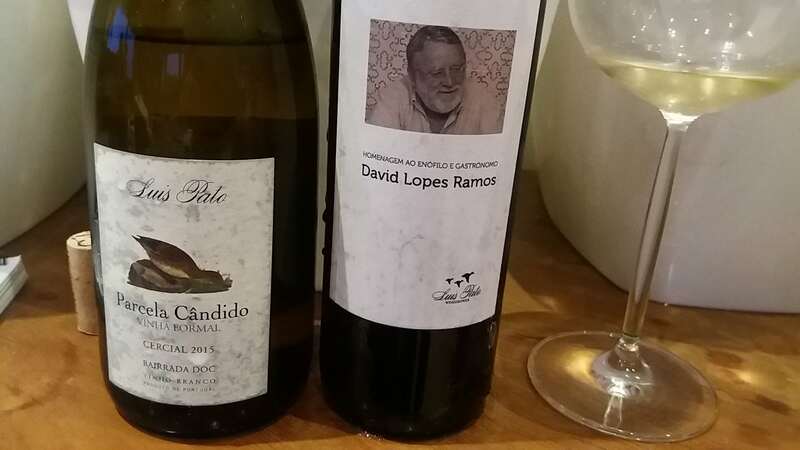 For Pato, “you can always make whites in Bairrada easily, because you can use some of the grapes to acidify – you don’t need acidification.” Cercial is the grape he has in mind; acidity can drop fast with Bical. Terrific salty, grapefruity drive with some oilskin phenolic/terpenic complexity. Lively, focused and lingering. Love the energy of this wine. An unoaked blend of Bical from chalky clay soil with Maria Gomes and Sercial from sandy soils. A leesy, fresh and fruity palate with just ripe apricot, blossom and funkier (fruit) bloom notes. The firm, tight and persistent finish forecasts its ageability…. An unoaked blend of Bical from chalky clay soil with Maria Gomes and Sercial from sandy soils. A more exotic palate with pronounced tangy mandarin, fennel hints, terpenic/spice notes and an attractive, waxy mouthfeel – nice palate weight. An unoaked blend of Bical from chalky clay soil with Maria Gomes and Sercial from sandy soils. It is markedly paler than the other wines in the line up, with greenish hues. The nose and palate are a touch smoky/flinty and the palate retains fresh citrus flavour – lemony acidity and pink grapefruit even. Savoury lees and creamy almond add mouthfeel, without detracting from the freshness and fruit. Impressive. An unoaked blend of Bical from chalky clay soil with Maria Gomes and Sercial from sandy soils. This vintage – a difficult one, said Luis, looks and tastes significantly more developed. It is yellow gold and I found an off-putting fried onion note on first taste; going back it had blown off a bit but this spicy vintage did not have the clarity of the others. This was the first vintage in which the Bical came from chalky clay soils. It duly supplied the flinty/smoky note, allowing Luis to dispense with the oak which, he gleefully remarked, makes it “cheaper.” Deep yellow gold with sweet tangerine, carraway spice with a nice cut of acidity. It has a touch of warmth to the finish, together with some funky, savoury lees. Good. All three varieties from this and the earlier vintages came from sandy soils; all were aged in new oak. Antique gold with pot pourri, roasted and zesty marmalade nuances. The oak makes for a more ‘solid’ style – quite fulsome and assertive through the spicy finish, the oak supporting the flavours as does a welcome wash of acidity to tease out the layers. Good. Antique gold/bronze, but less deep than the 2001. A lively, layered, long palate – really impressive – unfurls layers of roasted peach, dried herbs, cedar spice and saffron. Very persistent with a salty minerality to the finish which makes you want to go back for more. Excellent. 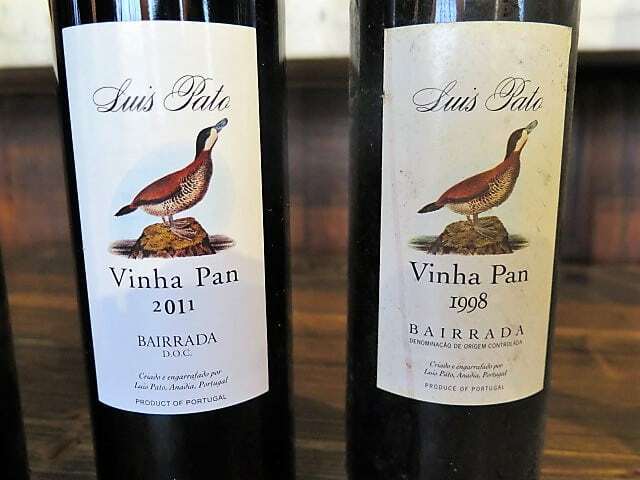 This was Pato’s first Vinhas Velhas and the first wine in Portugal, he said, to be labelled Vinhas Velhas (old vines). It still has great drive and perfume, with chalk-sluiced sour cherry fruit and, to the finish, a whisp of smoke/iodine. Lovely freshness and focus. Very good. At Vinha Pan in Panasqueira, a south-facing vineyard, Baga is grown on chalky-clay soil. Pato himself planted it to Baga in 1980. 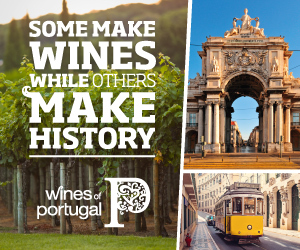 Being a young vineyard, he needed to reduce quantity, hence the green harvesting – Portugal’s first, from 1990. Pato generally extracts by pump overs (whereas Barrosa is [more gently] punched down). 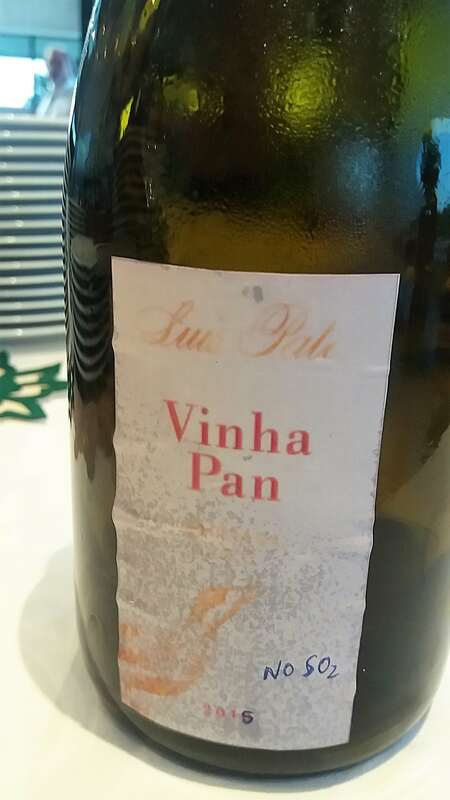 For Pato, 2015 was a “fantastic vintage, the weather more balanced, not as hot as 2017, but still hot.” Pan 2015 is very expressive – relatively open knit with blueberry, black cherry and cinnamon with good penetration of acidity to pin down the fruit, indeed some pomegranate crunch going through. Chamois tannins make for a long finish with an ethereal lift of sweet spices and coltsfoot/liquorice. Lovely. Pato describes 2013 as “a tricky vintage…it rained for 1 month” and yet there was hydric stress which slowed down the ripening process. For him, this vintage needs time – “maybe a bit like 2005,” while, he added, “’12 is easier to drink and ’16 will be very easy to drink [and in ’14, Pato made no single vineyard Bagas].” A very fresh, expressive Pan, with a deep swoop of cherries, red and black, the juiciness close to skins. Lovely smoky minerality too, with a fine plume of chalky, fine tannins to the finish. Youthfully vibrant, with classical poise. Very good. In this bountiful year, Pan is a deep plum/aubergine hue, with great richness of confit fruit to the nose, with a swirl of chalk beneath and liquorice accents, which follow through on a powerful, black-fruited palate with tertiary balsamic and woodsmoke hints. 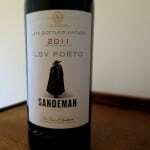 The tannins (long, ripe and fine) and acidity (chalkily mineral) provide the structure to harness and extend the fruit. A wine built to age, but with the balance to both impress and enjoy now. From a difficult year but holding its colour well. The nose and palate are firm, well-focused and exceptionally mineral, with blood, iron, iodine and smoke. It has an energy, a brightness, to its plum fruit which is thoroughly sluiced with minerals, as if filtered through limestone. Pine needle forest floor, moss, clove and sweeter lavender bring plenty of nuance. A real treat. Elegant and very persistent. Pato likens this year to 2013, though 2013 seems to have produced much better fruit purity. The weather was cool until September in 98 and it shows in this rather lean wine with its bricky rim and vegetal (winter greens and tobacco), smoky/camphor nose and palate. The fruit (tertiary, dried) doesn’t really get a chance to express itself. The tannins pin down the tight, salty finish, which has a hint of Camp Coffee. For Pato, this vintage demonstrated the effectiveness of green harvesting (he dropped 50% of the fruit). It rained after the equinox but Pato did a first pick – before his neighbours – because the grapes were ripe. 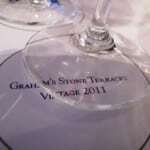 The ’96 is reminiscent of mature Burgundy in hue (burgundy with a narrow, bricky rim) and expressive flavour spectrum. It reveals sour cherry, lifted glace cherry and chocolate cherry truffle – a lovely sense of fruit and flesh – with pine needle, dried fruit and balsamic notes going through. Though mellow, there is a swirl of chalk dust too – a mineral-sluiced fine acid, tannin quality – which brings a certain levity and freshness to the whole. While it does not have the intensity or concentration of a good year, in magnum, this 21 year old vintage is very much on song. Very charming now. 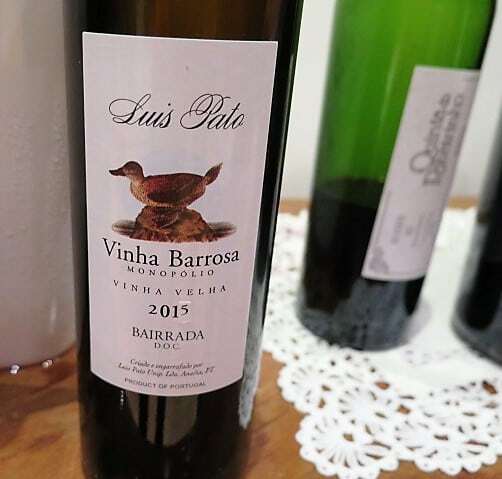 Vinha Barrosa is Pato’s oldest vineyard (plus 100 years’ old). It naturally produces 3-4 bunches per vine. Pato generally extracts by punch downs. Pato’s father-in-law bought part of the vineyard around 65 years ago, then Pato bought the other part, making it a monopolio. Like similarly aged vineyards, around 1% of the grapes are white. 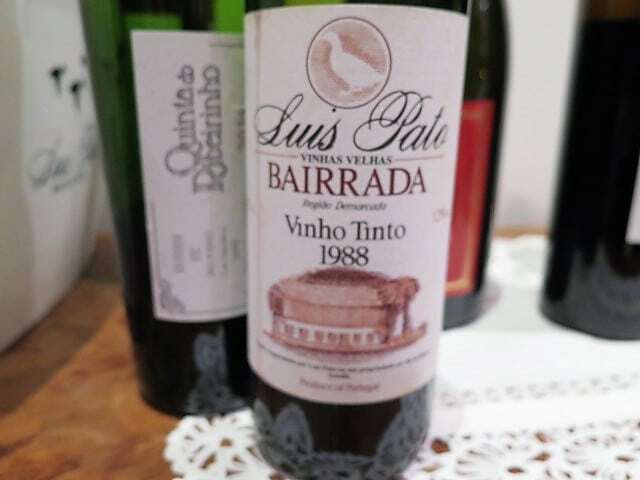 It was “normal in old times to plant 1-5% of white grapes,” he said, adding “it’s important to smooth tannins, like in Côte Rôtie or Chianti.” Vinha Barrosa is located in Aguim on chalky-clay soils and surrounded by a pine forest where there is also some eucalyptus, which contributes to its distinctive nose and palate. From 2017, Pato has started to cultivate this self-contained vineyard organically. 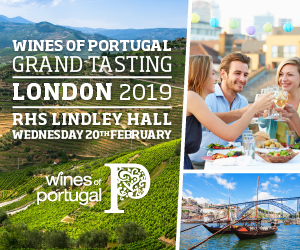 In another first in Portugal, Pato said he introduced single vineyard/monopolio labelling in 1995. The 2015 Barrosa is a beautiful, vibrant ruby hue with an intensely perfumed nose and palate with violets (almost parma violets), coltsfoot, eucalyptus and pine needles. In the mouth, it reveals bright, al dente red berry, cherry, cherrystone/almond and black currant fruit, which is well supported by plentiful but very fine-grained tannins. Sweet blueberry chimes in on the finish. Lovely with lingering fruit, flowers and spice, it is finer yet with more richness and layer than Pan. Terrific resonance/length. 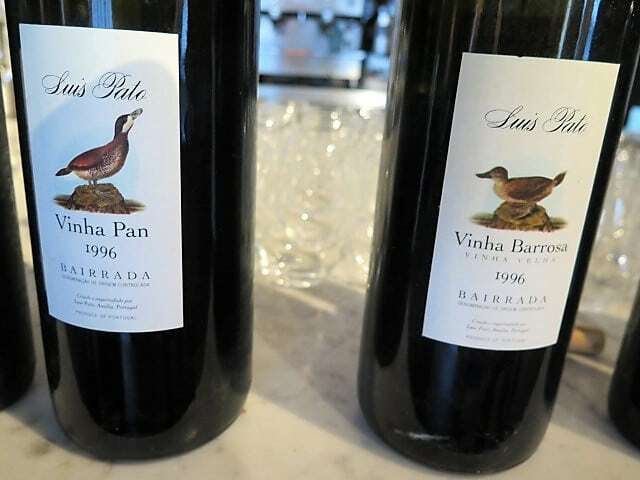 Outstanding; for Pato ’15 and ’95 are fuller than 2005. Barrosa was vinified in stainless steel vats during 2 weeks under temperature control, then matured for a year in new and used Allier oak casks. Again, more depth and layer than Pan. Riper notes too. Vinha Barrosa 2013 shows violets, with coltsfoot, balsamic and pine needle forest floor as it opens up. In the mouth it has lingering black and red berry fruits, especially black cherry, close to the stone and sweeter raspberry. The tannins are not as fine as the ’15 – chalky yes, but a little nubbly too. Bigger grain. Quite expressive compared with Pan, with persistent acidity to tease out that fruit sweetness. Pato rates 2009 and 2012 at the same level, though 2009 was a drier year. I found this wine surprisingly tight at heel. Iron fist in velvet glove. It is a translucent plum hue with eucalyptus and, as it opens up, pine needle to the nose and a hint of coffee. It’s a little more in the big boned, austere Barolo park for me, with a sense of fruit yet to be mined (hints of red cherry started to surface towards the end of the tasting). Pato revealed that this wine also spent 2 years in wood. The constant is the chalky minerality. Needs time. Like the Pan, Barrosa 98 is quite lean and firm, the Barrosa a little mushroomy too, with coltsfoot and pine needle coming through. I like its minerality, but I am not convinced that this wine will give of itself down the track. A bit hair shirt. Like the Pan ’96, Barrosa is mellow and expressive. It seems odd to say forward for a 21 year old wine, but it reflects the difficult year. 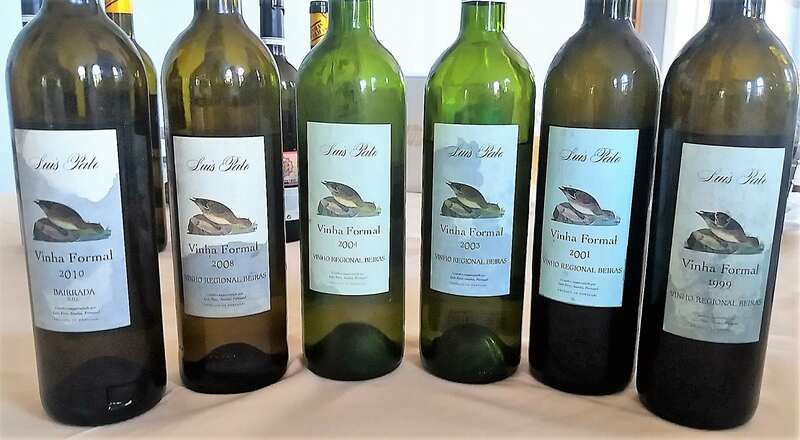 I found characteristics typical of mature Baga – a pronounced iodine/oyster shell note, dried fruits, with a hint of membrillo (perhaps some botrytis – Pato mentioned there was some in 1997 and, on his 20 year cycle theory pointed out there was none in 2017 because viticultural practices are better). It has Barrosa’s pine needle forest floor signature with, as one might expect from the year, a touch of mushroom too. Distinct umami to the (similar to Pan) chocolate cherry truffle notes (chocolatey tannins too), which makes for a soft, mellow finish. Lots of interest, but one to drink up. Pato was keen to show us the difference between his two Bagas from ungrafted (Pe Franco) vines. 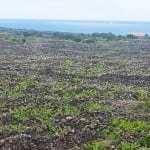 Soils (and vine age) result in quite different expressions of Baga. Pato explained that, in Bairrada, the impact of rain depends on the soil. If it is sandy and the vines are ungrafted, they absorb water immediately and botrytis can result (after a strong summer, vines drink too fast). On chalky clay, if it rains for 1,2,3 days, rain presents no problem at all. For longer, rain becomes a problem. However, Pato observed that calcium (which is found in active limestone) supplies more resistance against disease/rot because skins become thicker. Pato planted Valadas in 2004 in Ois, 7km south east of Quinta do Ribeirinho. 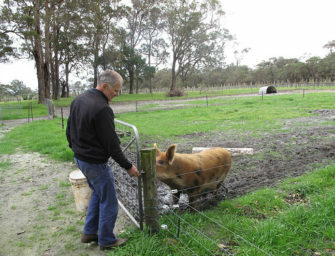 It’s where he lives now and where his wife inherited vineyards on chalky clay soils – ying and yang! Valadas is a tiny 0.4ha high density (8,600 vines/ha) parcel of Baga. Finer framed with silky tannins, inky florals, a hint of iodine/smoke and sluiced red cherry and berry fruit. Lovely translucency, minerality and frame makes for polished gem with a strong sense of personality. 13% You can read my review of the first 2011 vintage here. Because it is “so soft,” Pato ferments this wine with around 20% whole bunches.